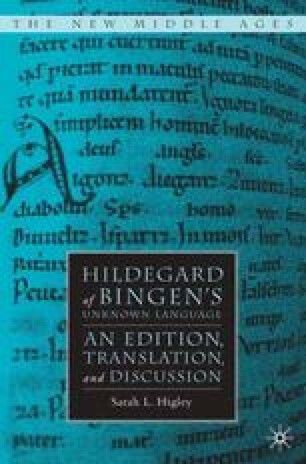 Assumptions about Hildegard’s glossolalic tendencies were an early reaction to the discovery of the Lingua, but they are curiously tenacious. In his 1931 article, Paul Alphandéry attempts to put Hildegard’s Lingua in the category of the glossolalic, but notes that it poses some problems. 1 He begins with a discussion of the Montanists of the second century, a group of mystics known for their cultivation of ecstatic and trance states, who were eventually looked upon with suspicion by the early Church.